The new Valley Metro Light Rail sails into a station near the Phoenix airport. 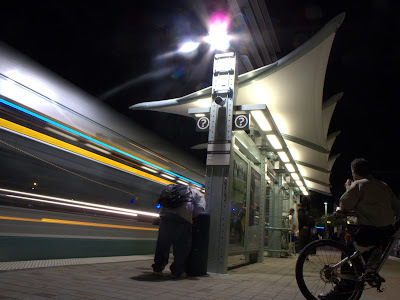 The new light rail line began service in December 2008 and like other light rail lines across the country it is a huge success. Canon G10, 2 second exposure at f/8.0, ISO 100, 11mm equivalent focal length, mounted on a Joby Gorillapod SLR and fired with a wired remote.